Al Miner of Irma, Wisconsin has worked in construction for most of his life so he knows a thing or two about putting up a building. When the time came for him to build his own storage facility he didn’t want to cut corners; he wanted the best! So it’s no surprise that he went with Armstrong Steel, America’s leading OEM manufacturer of pre-engineered metal buildings. DENVER –Al Miner of Irma, Wisconsin has worked in construction for most of his life so he knows a thing or two about putting up a building. When the time came for him to build his own storage facility he didn’t want to cut corners; he wanted the best! So it’s no surprise that he went with Armstrong Steel, America’s leading OEM manufacturer of pre-engineered metal buildings. Al is a process piping resource for contractors and plant engineers. He works diligently to be precise and cost effective for his customers and expects the same as a consumer. Al had previously built two other buildings for himself through other steel building companies and was not impressed. Al realizes you get what you pay for and reached out to Armstrong Steel to get the job done right. Much like Al, Armstrong Steel is focused on providing accurate, affordable, and high quality products to every customer. After a few conversations with Armstrong Steel, Al noted that Armstrong’s goal was not to pressure him into buying a building but to educate him and to ensure he wound up with a high quality building. Armstrong Steel recognizes that the project is not just a building, it’s an investment and the better informed and educated you are about the process, the better. “I’m extremely pleased with the way my Armstrong building turned out. I purchased my building with rigid frames at all locations. I highly recommend this option for ease of assembly, versatility, and strength. This is the third steel building that I have assembled myself (I did not give the previous suppliers a recommendation). The detailing on this building was top notch. Kitty, in the shipping department, was a pleasure to work with. The building was delivered just as they promised. I rate this as an excellent building experience,” says Al Miner. Armstrong Steel delivered and supplied Mr. Miner with a building on time and on budget. Armstrong goes above and beyond industry standards. By staffing in house detailers rather than subbing the detailing work out to India like many brokers choose to do, Armstrong Steel ensures the building parts line up without defect, every time. "You know, if you make a customer unhappy they're not going to tell five friends, they're going to tell five hundred friends. We have the right kind of culture here at Armstrong Steel that obsesses over every customers wants and needs and we have so many clients who treat us so well. We're at a point now where we have all of the things we need to build an important and lasting industry powerhouse. We're just going to continue honoring our customers and making great buildings! Everything else will fall into place. 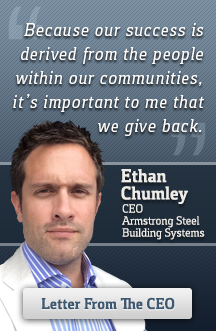 Word of mouth is very powerful," says Ethan Chumley, President of Armstrong Steel. In this industry, you get what you pay for but at Armstrong Steel you always get more than you pay for.